Join Cape Elizabeth Land Trust’s (CELT) Executive Director, Cindy Krum, a representative from the Town of Cape Elizabeth Conservation Commission, and CELT past board president, Kathleen Janick for the annual fall Cross Town Walk. Beginning at Portland Head Light, located at Fort Williams, this walk will traverse over 7 miles of both Town of Cape Elizabeth and CELT trails highlighting Cape’s great places. 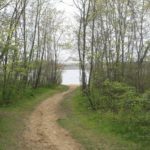 This walk offers a unique overview of Cape’s diverse ecosystems including Spurwink Marsh, Robinson Woods and Great Pond. The walk takes approximately 3½ hours and includes a picnic lunch at Kettle Cove. Hikers will meet at the Portland Head Light and will carpool (arranged prior to walk) back to Fort Williams after the picnic. Snacks, drinks and lunch provided. Participants should be 12 years or older; please call about younger ages.